The Chia Plant was for a long time a staple and important source of food for different tribes in Native America, including Aztecs, Mayans and Incans. As the population in the region of Native America declined, so did the popularity of the chia seeds and it’s use. As they entered the 20th century, Chia seeds were replaced by wheat and corn as the staple food. This is following Europe’s invasion and colonization of the New World. They brought and introduced their staple foods, including rice, potatoes (both Irish and sweet potatoes). 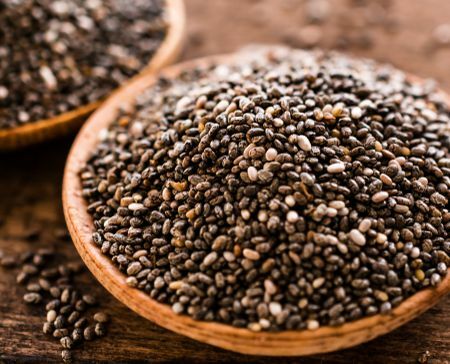 Chia seeds were thus long forgotten, but recently as people come to know the benefits associated with the Chia seeds, and studies showing their numerous health benefits, they have revived their use. One can purchase both white or black seeds, but avoid red seeds, which are immature, or small black ones which are weed seeds. Chia seeds can be taken whole or can be milled. One can add the seeds to any of their food, and not worry about changing the flavor as they are tasteless. Some people prefer to put on top of their salads, add to their smoothies and some add to their ice cream. As compared to other diets that are conventional, chia seeds have shown to slowly release the starches and carbohydrates. Therefore the levels of blood sugar do not surge after a meal. Due to the slow release of the sugars into the body’s bloodstream, their absorption by the body cells is optimum and there is an automatic diminish of the need for insulin. Thus chia seed are considered an ideal natural treatment, especially for type 2 diabetes. Chia seeds contain dietary fire in high quantities. The fiber helps regulate bowel movements and the general gastrointestinal system healthy. With chia seeds, you will not feel hungry quickly or after small intervals of time and the urge urges or temptation to eat unnecessarily. A combination of nutrients such as Omega- 3 fatty acids, fiber, proteins and carbohydrates, in moderation, in one meal, can help an individual significantly in the control of their weight. Chia seeds have all of these nutrients, and thus would come in handy weight control. Excess belly fat can be harmful to one’s health. Chia stabilizes blood sugar, helping the body with the fight of resistance of insulin, which is linked with the belly fat. Chia seeds also help with appetite regulation. a) Omega- 3 fatty acids– Chia seeds, aside from some certain fish, are one of the highest suppliers of omega- 3. Omega- 3 have high nutritional value to the body, and help in health of the brain, control of arthritis and fatigue, plus so many health conditions. b) Fiber– which is very helpful with digestion in the body, thus it is recommended that an adult takes a certain percentage of dietary fiber. 28gms of Chia contains 11gms of fiber. c) Calcium– calcium helps one to achieve stronger bones and teeth( oral health). Chis seeds have higher amounts of calcium than skimmed milk, thus recommended to reduce the deficiency of calcium in the body and eliminate conditions caused by deficiency, such as osteoporosis, and weak bones. d) Phosphorus– it is very essential in the body as it synthesizes proteins which aid in the growth and repair of the body cells and tissues. Phosphorus also helps in maintaining healthy bones. e) Protein– is a high value nutrient in the body. Chia seeds provide protein source, especially for vegetarians. f) Manganese– is an unpopular nutrient, but very essential in the body, It helps the body use up other nutrients like thiamin, and a single serving of chia seeds guarantees 30% of the recommended intake of manganese. People who consume chia regularly have shown similar results to the impact regular hypertension medication has. Chia attenuates major heart health risk factor in those with type 2 diabetes. Generally though, the omega- 3 in the chia helps protect the heart from cardiovascular risk factors caused by bad cholesterol, thus, it is a heart- friendly.